Photo: Montgomery House, ca. 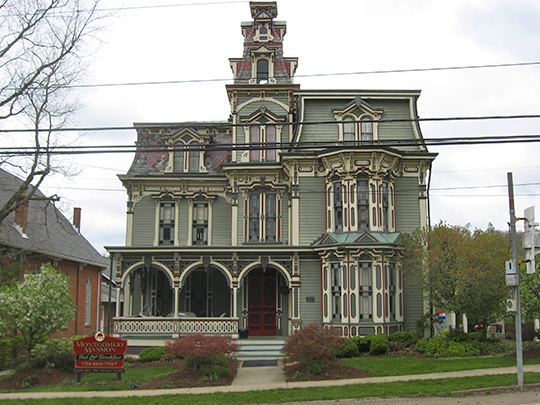 1880, 1274 Main Street (Route 40), Claysville, PA. Listed on the National Register of Historic Places in 1974. Photographed by User:Nyttend (own work), 2010, [cc0-by-1.0 (creativecommons.org/publicdomain/zero/1.0/deed.en], via Wikimedia Commons, accessed November, 2012. The Washington County Courthouse is located at 100 West Beau Street, Washington PA 15301; phone: 724-228-6700. Formed March 28, 1781; named for President Washington; originally part of Augusta County, Virginia. First court held here was two miles west on the Gabby farm, marked by granite block; inscription, "On this spot, was held in 1776, the County Court, for the District of West Augusta, Virginia; the first Court held by English-speaking people, west of the Monongahela River. Erected by Washington County Historical Society 1905." Chief industries, between 1860-80 raising fine stock and wool growing; in 1884, oil was discovered and for ten or fifteen years this county became an oil center, with some of the largest wells; now coal is being shipped all over the country from seemingly boundless veins. Washington County's history is one found in the records of our nation's development and is chronicled by numerous events that contributed to settlement of America. Indeed, Washington County sat at the forefront of westward expansion and colonization. Although the nature of its first inhabitants is still a mystery, historic records maintain that the first inhabitants were Native Americans of the Six Nations of New York. The tribes included Shawnee, Delaware, and the Iroquois (or Mingo Indians) who lived near the waterways and availed themselves to the plentiful wildlife found in the region. The Native American Tribes were left to themselves until French and English colonization began to encroach on these traditional hunting grounds. French expansion into what is now Washington County came as early as the mid 1660's when Robert Cavelier La Salle (Crumrine, 1882) set out to discover the existence of the Mississippi River. Although this initial trip was not successful, and did nothing to promote the colonization of the region, later attempts by both the English and French resulted in conflicts with native peoples to lay claim to the southwestern area of Pennsylvania. It was in 1749 (Crumrine, 1882) that the French formally laid claim to the Ohio Valley by proceeding down from Canada, across Lake Erie to the Conewango Creek, and eventually to the Allegheny River. It was at this point that the French explorers came across English traders and promptly wrote to Governor Hamilton of Pennsylvania demanding that future English trading cease at once. Over the next several years a variety of expeditions took place by both the French and English governments. Increasingly these expeditions resulted in skirmishes between forces that led to French control of the land west of the Alleghenies and marked the beginning of the French and Indian War. From this point on, Native American unrest in the region limited white settlement. It wasn't until 1758 that the English finally overthrew French occupation and began to renew their old alliance with the resident tribes. Unfortunately, as history attests, a peaceful European and Native American allegiance was never to be and it wasn't until near the end of the 1700's that peaceful occupation of the region began to be realized. The first white settlers who braved the Indian unrest were primarily of English, Scottish, and Scotch-Irish descent. This lineage would be the primary ethnic caste of the county until the industrial revolution of the 19th Century. The Revolutionary War between the Colonies and England came at a time when both Pennsylvania and Virginia were claiming the land west of the Alleghenies as their own. Upon the establishment of Westmoreland County in the beginning of 1773, there ensued a long controversy over which government held jurisdiction over what is now Washington County. Although the original charter to William Penn for Pennsylvania occurred as early as 1681, it was not until 1780 that the boundary of Pennsylvania was established and the following year Washington County was formed from Westmoreland County. The new county was quite large and contained what are now Greene, Allegheny and Beaver Counties. However, it wasn't long before the new county was reduced in size, when Allegheny County was established in 1788 and in the following year, more lands were annexed from Washington County to Allegheny. Established in 1796, Greene County's boundary was modified in 1802 to return a portion back to Washington County. The character of Washington County has been significantly influenced by its agricultural history, location along major transportation routes, abundance of natural resources and strength of its educational institutions. The early residents of Washington County were strong willed, as they had to be to conquer the wilderness and carve out a living. This spirit gave rise to a fierce drive for self-determination and independence.